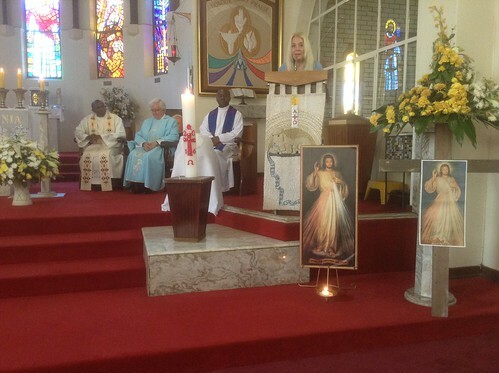 And the testimonies of those touched…..
Only weeks after the initiation of the announced jubilee of Mercy on December 8th (in the Catholic Church), Vassula was invited to South Africa. Her mission date was set for the first week in April 2016, during which the feast of Divine Mercy would fall. Being very much aware that Vassula had already taken 7 mission trips to South Africa, and I have been fortunate enough to have accompanied Vassula to South Africa once before, I was filled with anticipation as to what this mission trip may have in store, given that during this jubilee of Mercy, Misericordiae Vultus, we are invited to contemplate the mercy of God. With this mercy revealed to us in the face of Jesus His Son, we surely have expectations of God’s Mercy in abundance. By now, many of us know what Vassula speaks about when she goes to the nations around the globe. The messages of True life in God are now 30 years old and Vassula has been travelling around the globe as God’s echo for many years. As the person accompanying Vassula on this mission, I wished to focus on what I perceived and witnessed to be the impact of Vassula’s mission visit on ordinary people, those who came into contact with her over the days that were to ensue. I wanted to be able to report back on this. It is of great interest and use to be able to record thedifference, or the impact made when hearing Vassula speak about God through the charism she has been given. The impact makes, in other words, the so what factor. On the afternoon of March 31, Vassula arrived in Athens on a flight from Rhodes where she lives, looking fresh and prepared to embark on the mission. It is evident for any eye to see with what seriousness she takes the task entrusted to her by God. She had only just returned from a three week mission to South East Asia, visiting the countries of: Japan, Philippines, Singapore and Indonesia and had literally just enough time to repack and prepare for this next mission, turn around and fly back up to Athens to embark on this next mission trip. I for one took note of how focused she was and remains throughout any mission trip; this one was no exception. Her dedication and attentiveness reminds me of Paul in Acts 20-24…”but I do not count my life of any value to myself, if only I may finish my course and the ministry that I received from the Lord Jesus, to testify to the good news of God’s grace”. Whenever I have been with or in the presence of Vassula while she is on a mission trip and/or retreat/ pilgrimage, I notice that she never stalls or procrastinates. I always notice the strong attention that she gives, adhering to time and schedule and does not falter from this. After leaving Athens late afternoon on that same day with a 5 hour flight to Dubai and then catching a connecting 8 hour flight to Johannesburg from Dubai, we arrived in South Africa early at 5:30 in the morning. We were greeted at OR Tambo airport by stalwarts Gracinda and Winnie from TLIG-South Africa. We could feel the heat already building up, albeit in the mid-Autumn early morning; it felt more like a summer heat. South Africa experienced a lengthy drought during the summer that had just past. As we moved out of the airport and onto the street, being driven to St Andrew’s hotel in Bedford View, it was evident that we were in Africa. I could see from Vassula’s face that there was a connection for her to be back in the continent of her birth. Johannesburg is the business centre of South Africa and is a huge conurbation of interconnected communities and districts that have formed the huge metropolis. Travelling from one part of the city to another can take quite some time, as it is spread out and so vast. We were happy to arrive at the quiet and well situated hotel that was experiencing the end of its seasonal visitors, and we were able to rest for a couple of hours before Winnie and Gracinda came to collect us at 11o’clock. 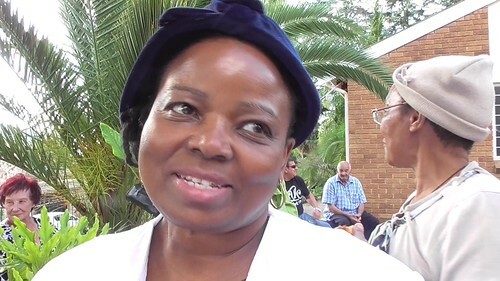 Vassula was scheduled to meet with a journalist from the diocesan newspaper that goes out to the whole of Johannesburg, and following that she was scheduled to be interviewed for a radio station. As we were waiting for Winnie and Gracinda to come to the hotel, the lady at the reception desk asked me if we were on holiday. I told her the reason for us being here was that my friend was giving a conference. I was being careful with how and what I said, not really wanting to say anything that may come across as alarming in any way, and at the same time, not wishing to hide the truth. Whist I was preparing to structure the next sentence in my head before saying it, the lady took my breath away by replying in such a pragmatic way, “Oh, your friend has the gift of prophecy, how wonderful”, and she said this while she was puffing up a cushion on the chair at the reception area, as if it were a normal occurrence to her. I chuckled inside and marveled at the advantage of the simplicity of people and their willingness to believe in God’s Goodness and Gifts as easy as this woman had done. For a brief moment I thought about the impossibility almost of that happening on European turf, especially in Western Europe! 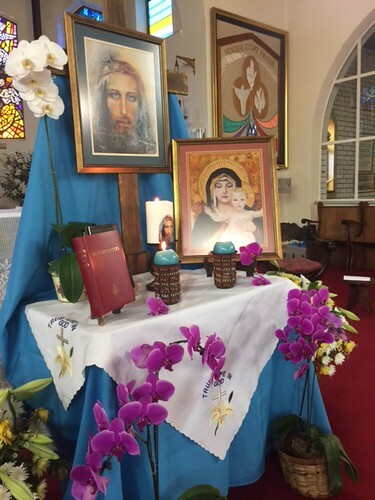 Vassula then came out to the reception area and we were transported by Gracinda and Winnie to the parish where a good and loyal friend of TLIG, Fr Shaun von Lillienfeld, is now based. 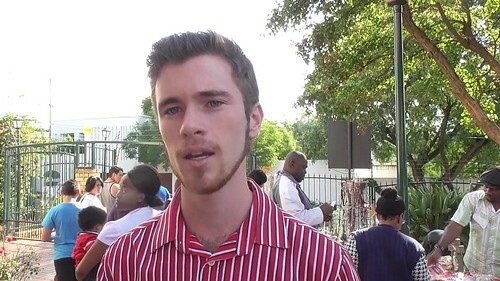 His parish is St. Martin de Porres, a Catholic church situated in the Craighall park area of the city. 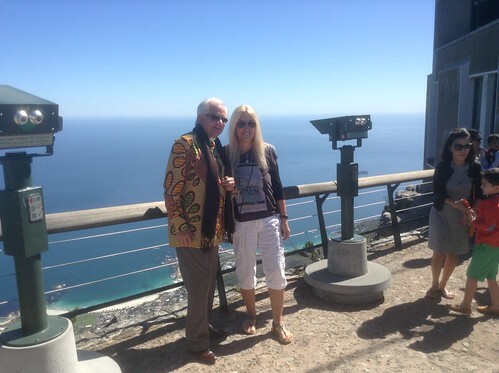 It took almost an hour to arrive there, given the explained vastness of Johannesburg and the traffic encountered. 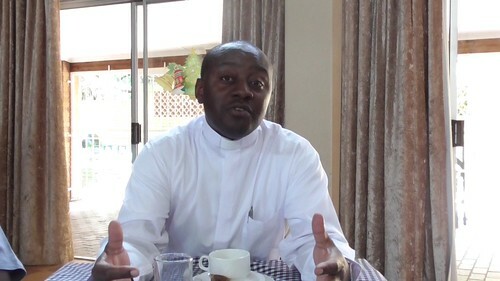 Vassula waited briefly in a room attached to Fr Shaun’s residence within the church grounds and was soon introduced to a journalist, Lerato, from the Archdiocesan news who wished to interview Vassula for an article due to go out at the end of April 2016. This publication goes out to every parish in Johannesburg. Lerato began by asking simply how long Vassula was to be in South Africa and how many talks would she be giving, in other words, asking her about the programme of the next 5 days. Then when she asked what the messages that Vassula would speak about would touch on, Vassula’s, response was, “The Mercy of God, everything comes out of the mercy of God”. My ears pricked up at this, given the explanation I disclosed at the beginning of this report, and I started to get an idea about the answers to some of the questions I had been asking myself. Vassula proceeded to give a resume of the messages, mentioning that TLIG is like a school, teaching us how we should really pray, in unceasing prayer and how to grow in Divine Love: how to properly repent, from our hearts, so that we can obtain the gifts of love and all other virtues and to love God the way that God wants us to love Him. She added that the world, I noted she said the Western world especially, has grown into a great apostasy, explaining that this is a rebellion against God and a sort of self-realization system that has been adopted, that pushes God away from us. Vassula shared that the strongest message is for the church, the call to unity in diversity, and that Jesus is not happy that we are not united, giving the example of the differences in the dates of Easter. I observed Lareto’s face as she digested this, Vassula continuing and completing her sentence with, “So long as this is not done, wars, catastrophes will take place. But, the Holy Spirit will call in such a way that the church will be united and then the Glory of God, the triumph will be seen”. She continued by explaining a bit about the Beth Myriams and the importance of establishing prayer groups: in the continent of Africa, there are 4 Beth Myriams. Vassula added that she believes everyone here, has been called. Upon looking at the journalist, she smiled and said I believe even you have been called here today. Lareto, with eyes as wide as a child’s listening in awe to a teacher, replied quite simply and authentically, “That’s wonderful”. With that, Vassula concluded the interview with a pragmatic, “This is basically the message of True Life in God”. I could see that this woman had been touched in some way; although this was not verbally articulated, the fact that on the following day she came to hear Vassula speak was, to me a testimony of that. This interview was quickly followed by a 30 minute radio interview by Chris Busschau for a program called the Melting Pot, aired on Radio Veritas. Although the interview was conducted on this Friday afternoon, it was to go on air on the Sunday show, which happened to be Divine Mercy Sunday. (This interview is downloadable on www.tligradio.org). 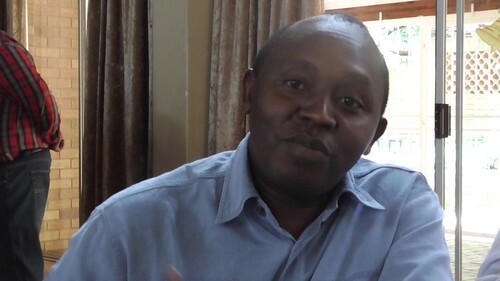 Vassula shared similar information as to what was shared Lareto when interviewed on the radio. She told us that she concluded the interview by saying, “Do not forget that God is Love and Mercy”. Following these two appointments, on the way back to the hotel, we discussed the day’s activities, True life in God and the people who have by God’s grace been called to this apostolate. Winnie shared a memory she had from a previous pilgrimage to Rome in 2011 in which Vassula’s son Fabian had participated. She was sitting at the breakfast table with Fabian and the Imam Mazarul Rahman from Bangladesh. Winnie shared that at that time, as they were in conversation about TLIG, Fabian said that TLIG people are like a mule, you can hit them from the left, or the right and they just keep walking! We all laughed, thinking nothing more about this, as we prepared to return to the hotel to rest until the following morning. 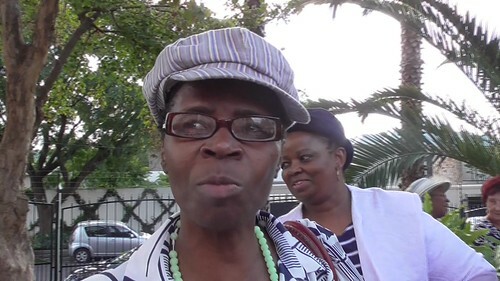 Vassula was picked up from St Andrew’s hotel late morning on Saturday, April 2nd, by Winnie and Gracinda. 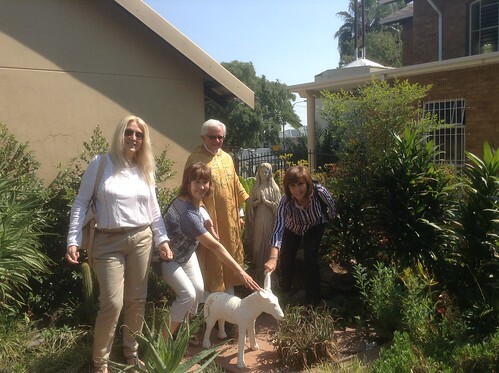 We all drove to the Craighall area of Johannesburg, back to the parish where Fr Shaun von Lillienfeld is the parish priest. Fr Shaun gave a humble and warm introduction to Vassula, promptly at 1:30 to a packed church. After inviting everyone to sing the Our Father in Aramaic, as the organizers had printed out the words and translation on sheets for everyone, she began, as is familiar to many now, by asking how many people were familiar with the messages of True life in God. She does this to gage the level of content of her speech, so that the attendees are learning; for TLIG is like a school, as she had told the journalist the previous day. Vassula’s speech emphasis was on the relationship that God wants from us. He does not wish us to have tepidity, but rather He wants our hearts aflame to witness a resurrected Christ; that is why He wants to fill us with His Holy Spirit. She emphasized yet again that in order for this to happen, there needs to be a sincere repentance from all of us so that the Holy Spirit can come and invade us. She emphasized that it is not enough to believe in God; as we know from scripture, even the demons believe in God, but have no love for Him. We are invited to know Him and understand Him through the messages of True Life in God, which adds nothing new to scripture, but acts as a respelling of the Word. In this year of mercy, Vassula emphasized that many people have an image of God only as a severe judge and that He does not care for them. The message that God gave to Vassula one day was thus: “If you want to be My Child, I shall be your Father, if you want to be My bride I shall be your Bridegroom, if you rebel against Me, I shall be your Judge.” In another message we see that God, although a fearful Judge, can be tender. This message was given by Jesus: “My Father is a King, yet so motherly, He is a Judge, yet so tender and loving, He is the Alpha and the Omega, yet so meek.” Vassula explained that we believe He is a severe Judge is because we have intellectualized God. She went on to say that we have made our image of God as some sort of petrified God in a museum or “somewhere up there (pointing to the sky) enjoying His Glory. This, she added, is a result of the apostasy. She therefore shared that the Father had said, “Do not fear Me; fear Me only if you rebel against Me.”Vassula explained that these words were and are for all of us and not just for her. Vassula quoted the father, where He tells us in the messages “You belong to Me”. You come from Me, you descend from Me, You are mine, you are My seed”. For a period of almost two years, Vassula has used her God given gift of art to paint a series of canvases based on Christ’s passion. She has done this as a fund raising effort to help support and sustain the efforts of the Greek Association for True life in God, as well as to benevolently contribute to the funding of the Beth Myriams that have been established in 37 countries around the globe. On this mission to South Africa, one of the canvases in particular was shown to the people who had come to hear Vassula and it was apparent upon unveiling the canvas for all to see, how powerful the subject of Christ’s agony in the garden was. I watched as people reverently looked at this beautifully painted image of Christ being comforted in the garden of Gethsemane and I observed the emotion that many conveyed as they digested what they were experiencing at that moment. Vassula’s speech contained so much more than what I am sharing here, but all was based upon the messages of True Life in God. The meeting was concluded with Vassula inviting everyone to say the prayer that the Father gave on February 13, 2016. Everyone felt part of one big family, as people watched Vassula leave the church, while they sang hymns of praise. People gathered around the church and church grounds for quite some time, as well as outside the church. Several people were willing to give their testimonies about the experience they had while listening to Vassula and spoke in general about TLIG. 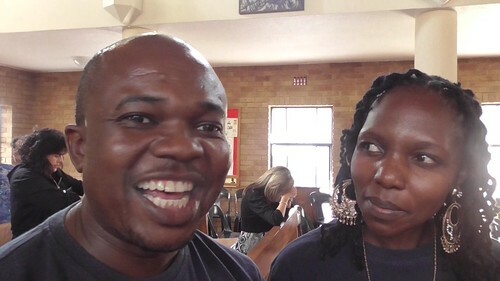 David and Vicky Mahlangu is a couple and in one of the prayer groups from Pretoria. David shared that this was the first time they had seen and heard Vassula. They have and have read the books with the TLIG messages. David added that the messages have strengthened his faith and understanding and that listening to Vassula today has reinforced what he has obtained from the messages. 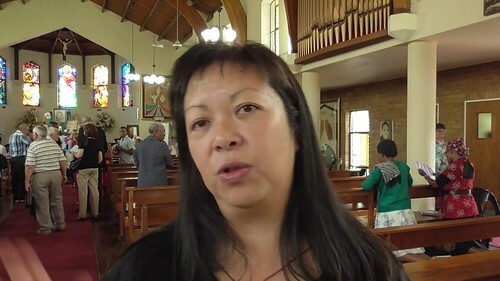 Vicki added that she was just an ordinary Catholic Christian going to church. Through the messages of True Life in God, she has realized the importance of getting into a relationship with God and getting close to Him; this realization has only helped to strengthen her faith. Glenda Tenner shared that as Vassula got up to talk, she saw her whole face become like Jesus’s face, “I saw there was a beard and everything and then the face turned back to Vassula’s face and then her face changed to the face of a beautiful young woman, not that Vassula is not beautiful, but this was a most beautiful young woman and then it went back to being Vassula’s own face again”. As the person recording these testimonies, I turned to ask the gentleman standing next to Glenda, who happened to be her brother, about his impressions. Nick Sun, her brother, said he didn’t see her face turn into Jesus’, but what he did see was her face change to that of a beautiful young woman. As he said this, his whole face lit up, as if he could not find the correct words to describe what he had seen. Penny from Soweto said she was impressed and touched very deeply, especially when Vassula showed the canvas that she has painted of Jesus’ agony in Gethsemane. Stuart Munroe, a young prayer group member from Pretoria who travelled to hear Vassula, said that he got a lot out of the talk; the emphasis was on how we should lead our lives with God. Tunokwe who is originally from Durban, but lives and works in Johannesburg, didn’t know anything about Vassula and the messages. 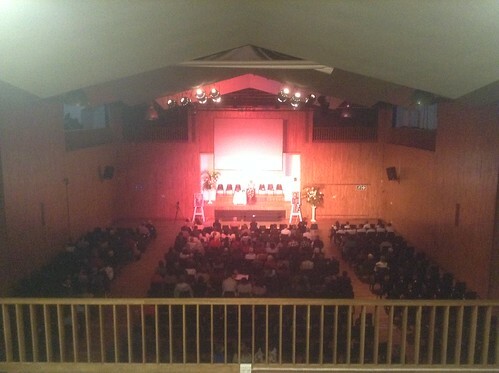 He was given a leaflet on the talk taking place “quite by chance”, about an hour before the talk started. 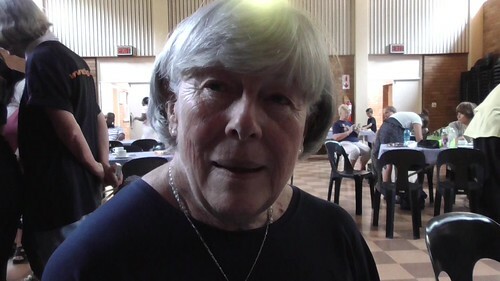 She shared that for years she was ashamed of Christianity and believed that there was something wrong with Christian doctrine due to the adverse things that she had experienced by Christians, particularly in the years of apartheid. Yet today, she shared that Vassula had helped her understand and gave her a lot of answers to questions she has had about God. In Tunokwe’s words, “She did it for me today; I know that’s the voice of God”. On Sunday, the day after following Vassula’s talk at St Martin de Porres, Fr Shaun invited Vassula to participate in the Divine Mercy Sunday Mass at 9 a.m., after which Greek Orthodox friends and members of TLIG invited Vassula and accompanying friends to join them for lunch. It was here at this luncheon event, that Vassula was able to finally meet with Fr George Coconas, a Greek Orthodox priest who not only saw the face of Christ on Vassula during a previous talk in South Africa some years back, but also again while Vassula was repeating to the assembly the words she had heard from God at the very beginning of her experiences: “You come from Me, you descend from Me, You belong to Me, you are Mine, you are My seed…” he saw, as he described it with emotion, a young Christ with a short beard. This went on, he said, on-off during the whole duration of that meeting. Vassula with Fr George and lay members of the Greek Orthodox Church discussing Vassula's charism. Upon arriving back to the hotel, we were there on time to listen to the broadcast of the radio interview recorded by Chris Busschau for the program, The Melting Pot, on radio VERITAS. Vassula, Winnie, Gracinda Fr George and I sat and listened to the interview, and again marveled at the clarity and precision of Vassula’s responses to the questions posed to her. After arising on the morning the following day, Winnie and Gracinda came to take Vassula to Fr Shaun’s church for Mass. We had forgotten that it was the feast of the Annunciation. It was a joy to participate in the Mass with Fr Shaun, Fr Daniel and Fr Sylvester, again at St Martin de Porres church. After Mass, Vassula was invited to meet with members of the Johannesburg TLIG prayer groups in the church hall to discuss evangelization. There was a hearty spread laid out of sandwiches and home baking, and of course the ubiquitous oriental pastries, as some of the prayer group members were from the Lebanese community. Vassula patiently spent time answering questions, signing books, getting photos taken with members and of course sitting with several people, encouraging them to spread the good news: to let people know of God’s enduring love and mercy. She emphasized that in these days we are hearing more and more about the persecutions of Christians; therefore, there is an even stronger need to evangelize. Vassula said that God needs laborers and it is a privilege to be a laborer in this particular vineyard. She gave tips, encouraging people to use social media to advertise and evangelize rather than pamphlets, to have meetings in peoples’ houses, so as to speak about the messages. Our task as lay people is to water the seeds until the churches fill up again; the messages are hope for this domain. She also encouraged people not to be afraid, as we know that the Lord says in the messages, “do your best and I will do the rest.” And: “Where you lack, I fill. In an effort to demonstrate this willingness to evangelize, she went on to share that whilst in Cyprus witnessing, she was concerned that her use of the Greek language would not be strong enough for her to deliver her speech. As Vassula explained to the Cypriot crowd, her Greek language proficiency is like that of a child speaking Greek. 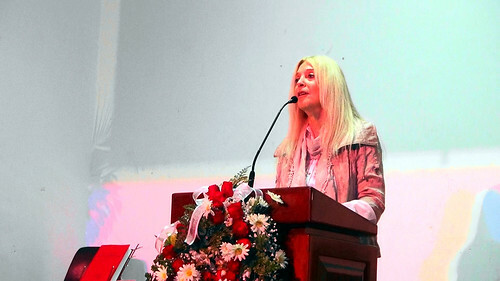 She started to talk in English and had Irini Zoppas translate the speech into Greek. One person interrupted and said loudly, ‘but we are all Greek here and we understand your manner of speaking Greek; you talk perfectly well. So please, speak in Greek.” She proceeded then to talk in her “baby talk” as she described it, and the Cypriot people were glad with this; they did not mind her poor Greek. However, there was also an English-speaking group at the far end of the room that complained after 10 minutes, claiming that they could not understand what Vassula was saying. So in her own words, Vassula said she panicked, and felt her adrenaline pump up from her toe nails to her hair and worse still, as she looked at the paper in front of her with her notes in English. The letters seemed as if they were hieroglyphics and the words were illegible. At first she thought it was the light, so she lit the little side lamp off the pulpit; still they seemed blurry and impossible to make any sense of. Then she thought to wear her glasses, but even then it made no difference at all. She therefore made the decision to say some of her speech in Greek, and then repeat what she said into English without faltering. She delivered the whole speech this way. She was concerned that after an hour of managing to embroider her speech in this way that she may lose the thread - but she didn’t! At the end of her speech, she needed to quote a message from the script that was previously unreadable, and having forgotten that she was unable to read it, the letters were clear and readable with neither any extra light nor eyeglasses!. The reason she shared this story was to again emphasize that this is how God works with her. He guides her the way He pleases; as Vassula often says to us, “Having given my will to God to use me as He wishes, He does it without fail. I want Him to use me like a toy car that needs to function with a remote control. I am the toy and God has the remote control in His Hands to guide me where to go and when to stop and when to turn around.” We are not to fear. His Will is that we “Christianize this de-Christianized world”. 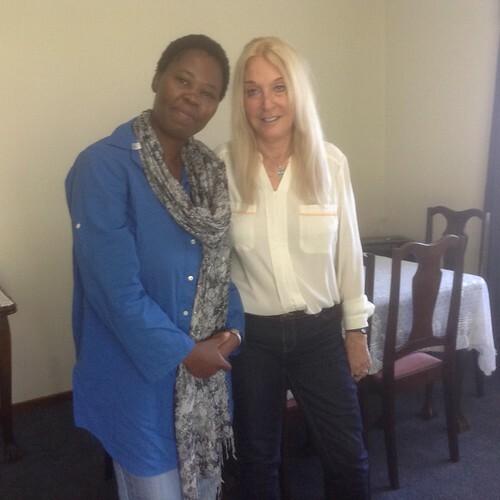 Collette Drews from Johannesburg wanted to share that her friend Maria had bought the Heaven is real and so is Hell book, (often referred to in its abbreviated form of HIR). This book is Vassula’s autobiography. Collette continued by saying that Maria’s niece, Lillian, who was badly affected by a drug addiction and at that time still misusing drugs, had seen and looked into the book. One day when it was lying in the kitchen Lillian said to Maria, “Buy that book for me please because unless you buy it for me, I’ll go to hell”. So my friend Maria bought the book for her niece. Lilian continued misusing drugs for a while, but eventually after reading and finishing the HIR book, she has become healthy again and is in recovery from her addiction. In the hall with the others who had gathered to listen to Vassula speak on the importance of evangelizing was Fr Sylvester who said that as a priest, listening to Vassula talk was an eye opener for him. She has touched on some very pertinent issues, both when she delivered her speech within the gathered assembly at St Martin de Porres church the previous day, and also as she sat in the church hall sharing with TLIG prayer group members on how we need to evangelize with love for Love. Fr Sylvester was especially touched by the emphasis Vassula made in her address about God desiring sacrificial love from us, the act of self-giving. In this secularized world he continued, this is needed more than at any time. What Vassula shares with us all through the messages of True life in God can only be good for the church. He also liked the fact that Vassula had emphasized the power of the holy rosary. She gave us news about something very important with which to fight Satan, making reference to the story a Nigerian Bishop had shared regarding the defeat of Boko Haram in his neighborhood through the power of the rosary. This happened after a very strong vision he had received regarding the rosary as a weapon against Satan. 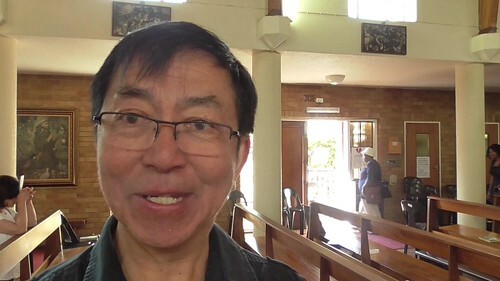 Fr Daniel had also come from Pretoria to hear and listen to Vassula on this mission visit to Johannesburg. He said that it is a privilege to read these messages. All of us are called to read them, as we are all called to be true witnesses to Christ. He said that the messages appeal in particular to those who are ready to be the mouthpieces of Jesus Christ. Vassula really shows us the way that this is done. Fr Daniel continued by saying that this is what we need, true witnesses, people who are sacrificing their time to witness God’s Mercy and love. Jesus is happy when we do this. If we can go out to share this message and touch other peoples’ lives, then this is exactly what Satan doesn’t want! 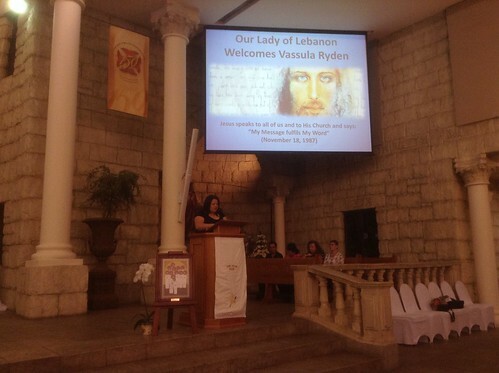 Following this approximately hour long meeting with various people about evangelizing, and also praying for healing with a young mother and her small child who has a disability, Vassula returned to the hotel to rest for a short period, before she was collected again to be taken to Mulbarton, to the Catholic Maronite church of Our lady of Lebanon. Fr Maurice, the parish priest warmly welcomed Vassula to his church, as she sat waiting in the sacristy for the crowd to gather and begin the recitation of the Holy Rosary in which Vassula wished to participate. Once seated in the church which has a capacity of 800 persons and appeared almost full, and after following the recitation of the rosary, Fr Maurice invited Fr Shaun to once again provide the introduction to Vassula, after which, she approached the podium. Once again, Vassula commenced by inviting the assembly of people to sing the Our Father in Aramaic. The words were projected on two large overhead screens for all to see. Vassula addressed the people who had come to Our Lady of Lebanon in a similar way as she had in the speech she delivered in Johannesburg. Many of the themes that run through these writings were touched on by her, such as: church unity, the need for love and humility to be exercised as the keys to unity, as well as many other themes. She maintained an emphasis on the Love and Mercy of God, and on the relationship in which we are invited to have with Our Triune God. Once more she referred to the great apostasy. The world is experiencing and emphasizing the need for us to make peace with God. She shared that Jesus in His Mercy comes to rectify our apostatized generation and to remind us of our true foundation. She explained that the first thing God asks from a soul is to make peace with Him and live holy. To make peace with God is to return to God's favor and intimacy, after a period of estrangement and rebellion through sin and transgression. She explained that this is how a soul abandons itself to God, offering one’s heart to Him as a token of one’s love. "Submissiveness seduces Me; stern as it might appear, it is the opening for Me to enter in your heart and do My Will." The emphasis she made was on repentance. Vassula went on to explain that everybody who desires salvation will feel the need to repent. God will listen to his/her repentance. The greater the repentant’s sincerity, the greater God’s friendship. Repentance is not a one-time action. As we are asked to turn our life into an unceasing prayer, so it is furthered with repentance. We are asked from God that our life turns into an unceasing repentance. God says that each word that is uttered to Him in truthfulness draws His friendship closer, for His friendship ensues in proportion to the repentance given to Him. The fruits gathered after repentance is love and dispassion. Thus, Vassula explains, you will be abandoning yourself to God, offering your heart to Him as a token of your love. Once He has your heart, a transforming union of divine love follows. She then added an explanation of what unceasing prayer is. It is when our spirit is completely absorbed in God, becoming sensitive to God’s Presence. I have heard Vassula many times reiterating the following well-known message from TLIG that she shared with the audience. The first two steps that the Father is asking us to take are: to become intimate with Him and to put into practice the "Fear of the lord". Vassula explains that the fear of the Lord is the beginning of Wisdom; it is the crown of Wisdom. To fear the Lord is avoidance of all evil. "Come and inherit what lasts forever by allowing My Spirit to enlighten your mind and your body with His divine light, allowing Him to animate your soul in the intimacy we desire of you in Us..." "Come and approach Me and get to know Me and you will learn to love Me, for this you have to become intimate with Me. Nevertheless, never forget that I AM HOLY." Vassula was able to show the people who had come some of the literature on True life in God that would be available at the end of the meeting. In particular, she made reference to the Heaven is real but so is Hell book, her autobiography that allows people a chance to receive an introduction as to what is to come, and therefore provide them an appetite for reading the messages. She also talked about a new book hot off the press by a Sister Anne Woods who is a hermit in England and has spent about 4 years researching the True Life in God Messages. She examined them from the point of view of authenticity and spiritual content. She came to the conclusion that these Messages are not only extremely important, but that the writings had enough clues in them to point to the Jewishness of their Source and their complete agreement with Scripture and the Teachings of the Church and Saints. She is unique in her study to have discovered these sensitive points, especially when noting the reason why there are no full stops (periods) or capital letters when a sentence begins. No one ever had an explanation to this and she was the only person who knew the reason for this manner of writing. She continued to explain that this book is a wonderful source of Sister's scholarship, and in addition it is aimed towards enlightening any lay person who wishes to find out more about Union with Christ: whether one is truly on the right spiritual path. Sister compares what the Catholic Church calls Mystical Marriage with what we read in the Messages as divinization (an Orthodox term). The Preface of her book makes an attempt at reaching out to all Three Divisions in the Church: Catholics, Orthodox and Protestant. Vassula recommended this unique book which she values, stating that it should help all TLIG readers not only to defend the authenticity of the Messages, but also to understand factors about the Messages that our mind otherwise would not grasp. Vassula added that she believes Sister Anne Woods was inspired by God to do this work and referred to it as a treasure. I have witnessed many times that when there is True Life in God reference material and an availability of resources at any public meeting, be it at an event in which Vassula is speaking or one an informative True Life in God witness talk presented at a more localized level, people are curious and approach the stall where the resources are available. This is a very important evangelizing aspect; it is like the tool that the worker needs to help produce a harvest. Vassula spoke for almost one and a half hours, covering many other concepts about the messages of True life in God. She never faltered in her thoughts and remained focused in transmitting God’s message to the crowd who had come to listen. She concluded by inviting everyone to recite the prayer given by the Father on January 13, 2016, as she had done in Johannesburg two day prior. 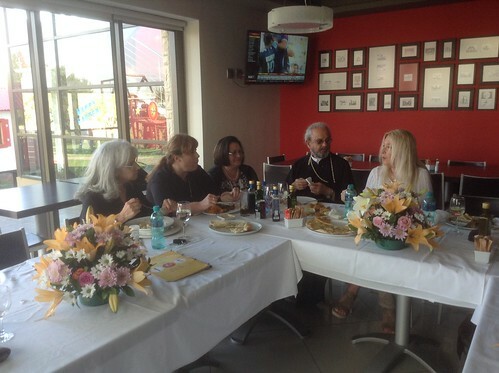 Once the meeting concluded, Vassula met briefly with Fr Maurice and another Maronite priest, Fr. Pierre Chemaly who had come to listen. They sat with Vassula and Fr Shaun for a short while, sharing experiences and talking about the event that had just taken place. Whilst Vassula was speaking, I went out to the church vestibule which held a cacophony of noise, as many people had gathered around the book stalls to buy True Life in God materials. Some people wished to obtain single volumes of the messages, whilst others wished to purchase the One Book: all the volumes in one. Many others wished to buy the new book by Sister Anne that Vassula had referred to in her speech. I found it hard to even hear myself think, such was the noise and excitement. It was at this point I noticed a young woman named Melanie Lester, who was in tears after hearing Vassula’s talk. I asked her why she was crying. She responded saying that when she had come to the church that night to hear Vassula talk, she had not heard of Vassula or the messages before, but came out of curiosity. Physically, she had had an excruciating pain in her back for over two days. It was so bad when she came into the church that she had to kneel on the kneeler by the pew, as she felt as if she had been thumped in the back. After the talk, which she found most wonderful, she began weeping because she became aware that the pain had suddenly gone. She attributed this to what she had experienced through Vassula’s witnessing. This woman was really very moved by this experience. In the vestibule I managed to ask Bruno and Marina a young couple from Johannesburg what they had experienced by coming to hear Vassula. Bruno began by saying that they had both heard many stories about Vassula and tonight’s talk had been a real eye opener. He said that they are aware that what they heard tonight are lessons for them to continue praying and to show repentance. In general, they felt that it was good guidance for them; they both appeared exuberant. I did notice that there was an electric atmosphere in the church vestibule as books and DVDs were purchased by eager people; there was a pervading sense of joy and peace. I felt that very tangibly. Arising at 5:15 a.m. the following morning we prepared to get to the airport. Accompanied by Fr Shaun van Lillienfeld, Winnie Williams, Gracinda Jardin, Manuel and Maria Ferreira and Andrew from Johannesburg and myself, Vassula departed Johannesburg for a 2 hour flight to Cape Town, arriving at the International airport at 11:30 in the morning. 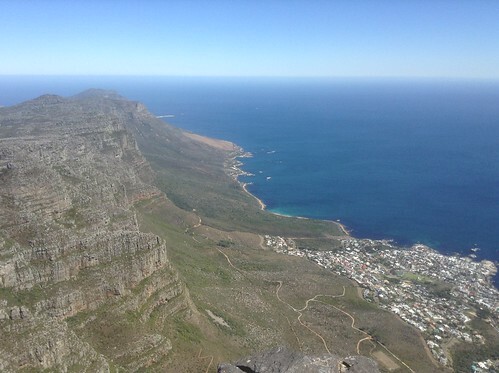 It is a 2 hour flight from Johannesburg to Cape Town. 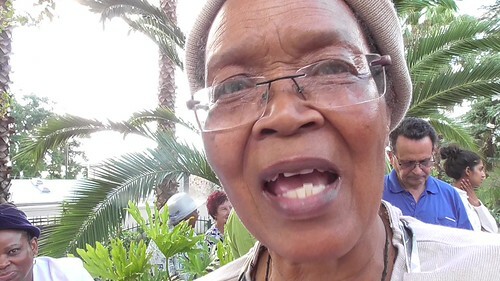 Once again with canvas in hand, we met the people from the prayer group in Cape Town, namely, Thelma and Leo Coert and Lucia Pollard, who kindly drove everyone to respective guest houses in the Bloubergstrand area of Cape town. Following check in and lunch, Vassula collected herself for a few hours before departing for Milnerton high school where she would deliver her speech. The event started at 7:15 with a warm welcome from Fr Borello and an introduction once again by Fr Shaun. Once more, while focusing on the theme of love and repentance, Vassula called people to be in a deep relationship with God. 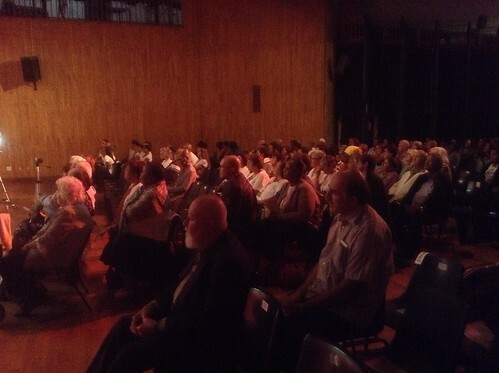 The delivery content was based around that of the previous two talks given in Johannesburg. I walked around the school hall to have a look for myself as to how people were listening. Although it was a smaller crowd than that of the two previous venues, I can report that the attention of the people present was intense and fixed. Vassula spoke for over an hour, after which many people appeared deeply moved. Afterwards, a number of people provided an account of what they had experienced, which is written below. There was an expectant buzz in the hall as Vassula entered the high school and many books were on sale. Many people purchased books and 36 people registered for TLIG for prayer group information. After the talk, the entrance was again filled with excitement, as people appeared joyful after having listened to the hope and love received from the talk on God’s calling to all of us by Vassula. 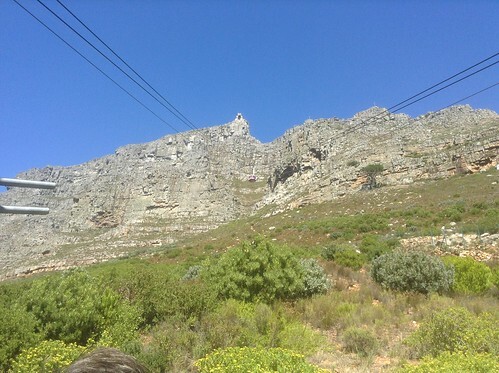 Following the three talks that Vassula had given, as well as the time she had spent giving interviews and talking to various smaller groups of people over the last 4 days, the prayer group in Cape Town wished to take Vassula up Table Mountain for a day, so she could perhaps relax a bit. They had kindly arranged this for the group of us accompanying her. We set off late morning and arrived at a place where a set of cable cars take groups of 21 persons at a time up the mountain. In the splendid sunshine, we were soon transported right up to the top of the mountain where the most spectacular view of the east lay before us. Vassula pointed over to the direction of one of the bays, which I noted was in the shape of a heart. In a rather quiet voice Vassula said to Gracinda, Winnie and me, “Let’s go over there and preach to the birds, perhaps they will listen”. 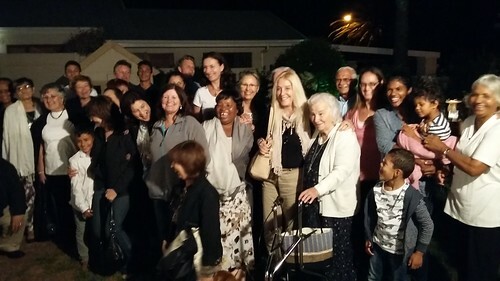 A few hours later, Vassula and the group met together to visit Loretta, a remarkable woman, 90 years of age, who started the TLIG prayer groups in Cape Town a number of years ago. Loretta spoke briefly about her life and experiences and how she came upon the messages of TLIG. She initially had rejected any invitation to read the messages of True Life in God, as she believed her Catholic Christian faith and the way she practiced sufficed. Only a few years later, whilst visiting the local library, she stumbled on one of the True Life in God volumes and took it home to read. She thought it looked interesting and didn’t relate it to any previous knowledge she may have had about Vassula and True life in God. She devoured the volume she read and only desired more. 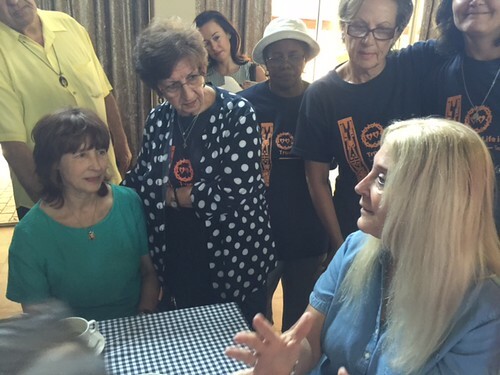 This set her on a trail of enquiry that has a very positive conclusion; she had the inspiration to begin the first TLIG prayer group in Cape Town: one that continues to this day and is flourishing. 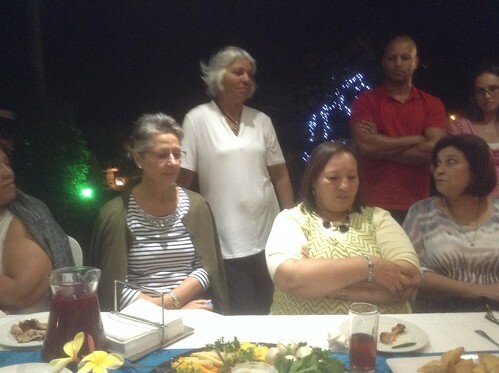 This prayer group invited Vassula to share supper with them at the house of Lucia and Tony Pollard, as it was the last evening before Vassula was due to leave South Africa. The group was gathered around a table with Vassula sitting in the middle so that everyone present could listen, as well as use this opportunity to share their respective experiences from the previous night’s talk. 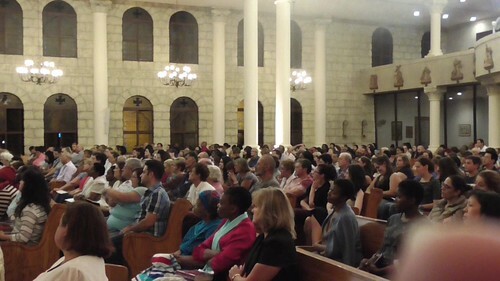 Johanna Schwarz who is also from Malawi, but living in South Africa, shared that as she began to sit down on her chair during last night’s talk, after standing for a bit of time, she became motionless, unable to sit down, stunned at what she saw. Vassula was indeed on the platform, standing, but couldn’t be deciphered. She said to herself, “Who is that standing there?” A coat that Vassula was wearing was blue-ish green and her head was like a silver veil, falling down about her face. (Johanna made the motions of a veil falling as she told this). She added whilst looking at Vassula who was listening to Johanna’s testimony, “There was a crown on your head and on the crown was a star...it was beautiful” I then heard the words, “God’s’ love endures forever” being said. After this vision, Vassula’ face and body returned. Vassula responded by saying, “Pray for me and I’ll pray for you (as she did on the previous night). I was frozen, standing there listening. In actual fact, Vassula was wearing a beige silky jacket, but had on it neither the colors blue, green, nor silver. 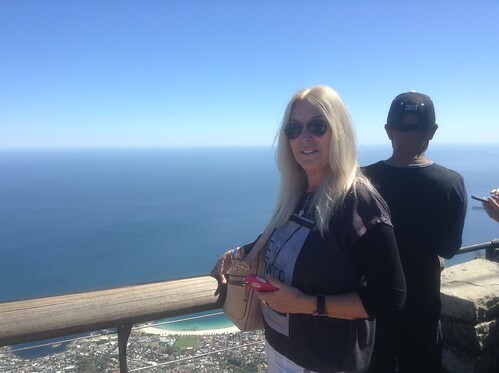 Celia Hutchison who had also been at the assembly the previous night asked her husband, who was with her if he could take a photo of Vassula whilst she was talking, as she described seeing “an aura” of light around her. She mentioned this while we were all sitting around at the table. As others heard Cecilia’s account, namely, Leo and Thelma Coert, as well as Elizabeth Bernstein,they concurred seeing the same. Marilyn Da Corte shared with Vassula that, “Looking at you and listening to you, I was filled with God’s tender Love and God has allowed me to be more open to that”. Antonette Coert said that “during the TLIG conference from the moment Vassula walked into the school she looked so ordinary and calm, a lovely lady. I got the sense of peace. When she started talking I almost instantly could see Our Lady. I heard Vassula speak, but it was as if Our Lady took over and was trying to explain the importance of what Jesus wants from us” and how important He is. I saw a light blue glow behind Vassula on the stage; it was quite wonderful. Elizabeth Bernstein then shared an incredible testimony as to what True Life in God has meant for her in her life. She shared with everyone at the table and apologized for crying; she became emotional as she shared her account. When she was child she damaged the 3rd and 4th vertebrae on her back. From the day this accident occurred, she had pain. This lasted for many years and the pain went right down her back. She explained that her back was skewed. She has been to doctors and x rays clearly showed the skewed spine. She continued by saying that in 2012, after she had joined the TLIG prayer group, and three weeks after having bought the first volume of the TLIG messages, she was in such pain; she sat in the garden chair, wracked with pain. In pain, she read a message on the second page of the book that said, “I am the way”; she read, I am the way if you are in darkness I will take you to the light. If you want anything from Me, ask. When she read that she thought, “Promises, promises, empty promises”. She put the book down and just said out loud, “I’m going to ask you now will you heal my back, because I believe”. As soon as she said this an intense vibration filled her back. She her whole body tensed up at this and the vibration or whatever it was, came out of her mouth. She didn’t know what had happened and told her husband about it. That night she could hardly sleep due to the excruciating pain; however, when she got up in the morning, she shouted out, “It’s gone!” I then wanted to show my husband the True Life in God message I had read, and yet when I went to find that message, I couldn’t find it. I went to the doctor and I got x-rays taken. She then showed her x-rays to Vassula and to all of us around the table, which demonstrated that her spine is now completely straight. The two x-rays (which you can see here) of Elizabeth’s spine, one taken in 2009 showing the deformity she explained and then in 2012, totally healed. The actual message that Elizabeth referred to is on page two of the complete volume Book of the messages and it says, “I Jesus am the Way; every time you feel lost, call Me, I will come to you and I will show you the way; I am the Way." (September 28th, 1986). Thelma Coert also shared that she had had difficulties with her back well before the birth of her two grandchildren, which prevented her from picking them up or lifting them, lest she injured her back further. According to former x-rays, the top of her spine was worse than the bottom. However, since her involvement in TLIG, after one month, six months and then a year consecutively, and as indicated during her check-ups, her back problem has been rectified; it does not exist. She hasn’t been to the doctor for a whole year now. She states that she is “absolutely healed of her back”. All too soon, it was time to depart from the gathering and the sharing of some of these testimonies, which I heard Fr Shaun refer to as “awesome”. I felt privileged to have been present for them at this moment. At one point, I was overcome with emotion while listening to a testimony of the power of God’s Love and Mercy. Upon returning to the hotel late evening, Winnie, Gracinda and I watched as Vassula retired to her room. We chatted together in a road to Emmaus type way, as the three of us agreed that it had been quite a day. 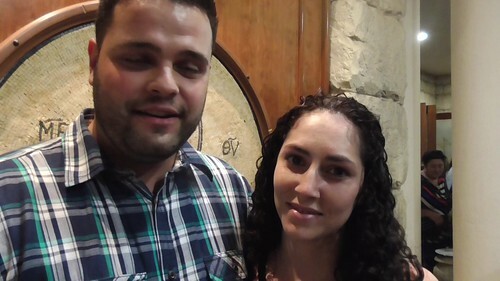 I am Stephanie Azar, a mother of 2 boys: James 6 and Jude 5, living in South Africa. I have recently become very ill with a rare kidney disease. 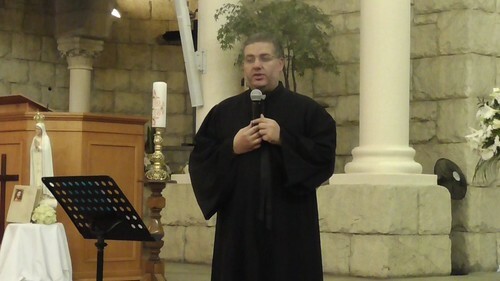 I was released from hospital a week before Vassula’s arrival in South Africa and made up my mind to attend the talk at the Mulbarton Maronite Catholic Church. After the talk, I purchased my own TLIG (Volume 1) book. The next day, my son James said that did not want to go back to school “tomorrow,” after the school holidays, as some things at school were worrying him. The boys then wanted me play with them. I was so tired and looked around for something to keep them occupied. I spotted the book on the table next to the bed, took it and said “boys, do you know that this is really how Jesus looks?” They were instantly captivated. I turned the book around and showed them the picture of Vassula and said “you see, this lady. Her name is Vassula. Jesus speaks to her and uses her hand to write down what He asks her to write.” James was so excited and said “mommy, He has such beautiful eyes and eyebrows; can I kiss His face and please can you read it to us?” I did and explained that as we read the messages, we can use our own names instead of Vassula’s. I opened the book randomly to page 411: December 27, 1988; it read James do not worry about tomorrow. Do not worry, trust Me……….. I love you and will not see you fall……. James began to cry and asked me to read more. I read another message, “James do you remember when I touched your shoulder and whispered in your ear.” He was sobbing and answered “yes mommy I do remember.” The more I read and explained the messages to him in terms he would understand, the more he cried. He asked if Jesus would also talk to his brother Jude. I said yes and read a paragraph with Jude’s name and James continued to cry. He would not let me put the book down until his father came home. My husband asked “why is James crying and his eyes so swollen?” I explained and then James said, “Daddy, this is the best book ever!” He asked his dad to take a photo of Jesus’ face to keep on his phone so that he could always look at it. Now when he visits his granny Soraya, he always asks her to read to him from the True Life in God messages. These testimonies were all sent to Cecilia Hutchison, from the Cape Town prayer and organizer’s group, whose own testimony is also provided. After Vassula’s visit, these people contacted Cecilia to give her their testimonies and are quoted as having provided them to Cecilia. “I came to the talk with an incredible backache… Vassula presented her talk and ended with a very touching prayer… I was suffering with an incredible backache and during this intense prayer I implored God’s mercy to relieve me of pain and heal my pancreatic cancer, if it is His will. I then went for tumor marker blood tests on the following Friday and my CT scan and marker had dropped from 4500 to 770! I will continue to receive God’s Blessings in my personal life… I trust in the Divine Mercy”. “The evening after we had the gathering, I was in bed, praying. I felt the warm embrace of the Father and His mercy like I never did before. I felt as if He really did stand up from His Throne and lean down towards me”. “Hi, yes Cecilia, in actual fact I emailed Fr Borello today! I’m not sure if he received my note, as it doesn’t indicate it on my sent mail; I had sent it by phone. I experienced and am still experiencing a profound sense and a presence of peace and calm. At the talk, maybe halfway into the middle of it, (I’ve been trying to remember the words Vassula spoke) I felt very uplifted and filled with immense love. I was looking at her, but I couldn’t focus. It was like double vision; she was coming forward and moving backwards like a kind of pulsating vibration. Her face seemed to be crumbling down and up. While still trying to focus, I saw a sad face on her of love and humility. I was filled with a tearful emotion of tremendous love for Jesus. The first few nights after the talk, while sleeping, I heard Vassula’s name continuously, very strongly and clearly. During the day, I’ve been feeling incredible peace enveloping me and it’s very beautiful”. “I had no doubt at all that God uses Vassula to spread the word and reminds us that He is alive”. “Hi Cecilia, I was touched at first by her simplicity. Then Vassula had a facial resemblance to the Lord while on stage, with the messages flowing as she spoke. The testimony of the Nigerian Bishop who was given a sword by Jesus that turned into a rosary pleases me a lot. This rosary, the prayers he made with the rosary enchained the Enemy. I had had a bit of doubt about the legitimacy of the prophet, but now I read the True Life in God messaages as if Jesus is speaking to me. Thank you all for making that meeting happen; Blessings”. Two gentlemen from the venue’s information desk wanted to know how old this girl was on the stage. When I told them that she is a woman, aged 74, they said they saw a young lady. They could not believe she was that age. They also asked if we could contact them, as they wanted her book but had no cash on them. See info slip. Many people whom we spoke to at the info desk said they felt blessed, spiritually renewed peaceful, calm, awakened; the messages were powerful. 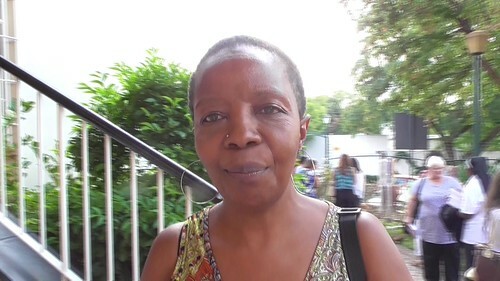 “Cecilia, when I initially read Vassula’s book which I bought a few years ago, I could not get into it. I did not believe it to be true. I am so grateful that you invited me. On the night she spoke I felt everything she said was true. A peace came over me and I felt calmness and hopefulness. I saw a yellow halo behind her head, even though I sat right at the back. She looked extremely young. I cannot stop telling people about Vassula and the messages; I still feel as if I am in a bubble”. “I have been following Vassula on the internet for the past 3 years. Through Vassula I felt God’s presence very close to me and I just knew that she was speaking the absolute truth. I just want to spread the word. My daughter Veronique asked if I was praying for her. She is in Germany. At the moment of Veronique’s request, Vassula said, ‘pray for me, I for you and Jesus does not have to know a name.’ My husband Ken is also very happy. He went and feels peaceful and calm”. “When Vassula was praying the prayer that God wants us to pray daily, I felt so touched that the tears were just flowing. I could not stop myself. A peace came over me”. This was Mary’s son’s girlfriend. Cecilia also added that she had met three nuns who attended Vassula’s last visit at Holy Redeemer. One of the nuns told me that she saw the face of Jesus on Vassula that evening. All three now know of her and asked if I could keep in touch with them; share the messages with them. I will be sending them Vassula’s message from the 13th Feb, along with the prayer. Day 7 the return Journey: The “What”, “So what “and “What next” factors. Upon departing Cape Town late morning, so as to fly back to Johannesburg to catch an evening flight back to Dubai and then further on to Athens, I saw the mission to the Rainbow Nation draw to a close. After these extraordinary experiences that were shared, it was evident to me that the organizers’ hard work had certainly ensured that the event went smoothly. This was one of the questions I had asked myself as we flew to South Africa for this mission a week prior: how would the events transpire? The answer to the second question about who will come and what would take place at each event came through listening to what Vassula had said both to Lareto the journalist from Johannesburg and to all 3 assemblies that she addressed, “You came because God called you”. As for the question ,”Will there be a change in people’s lives?”, it appears that The Lord provided us with that answer too, by virtue of the fact that people provided their testimonies throughout the week and are documented within this report. In reflecting on what all this means and if we consider TLIG as a school, experiential learning is based loosely on the above questions. The “what next” is asked of us throughout the messages of True life in God and indeed throughout this report, based on the evidence provided both through Vassula’s speeches and people’s individual experiences and testimonies. In a message from October 11th 1993, Jesus says: “I will instruct the wretched and the poor that their Father in Heaven is their Guardian, a saving God; I will remind them that they too are ranked as His children, and they could call Him, “My Father” and if they ask “where is Understanding to be found?” I shall say: Understanding My Child is avoidance of all evil………..then out of these I will make a mighty people with the majesty of My Name; and when they will be rebuked and asked by the apostates: “why are you rejoicing aloud? How dare you proclaim God’s word in His sanctuary, you defiled lot!” I will tell these apostates: if these keep silence the stones will cry out even louder until they will deafen your ears; today this very day, I am taking away from you My Kingdom and am giving it to his remnant, since you are not going in yourselves nor allow others to go in who want to; from now on I shall be their Counselor and their King within them; I will from now on send them to the cities to proclaim My Love and pass onto others the Tradition I myself have given to Peter and my disciples; since this remnant will be grafted on Me, they will clean my cities and put an end to transgression….. My command to you is to love Me…go from nation to nation proclaiming my words, be My Echo….."
Particularly in this year of Mercy, we are given this invitation and opportunity to proclaim God’s love and Mercy, to love God and to bring souls to Him. Simply put, the what next is about how we now choose to prove that we understand and to proclaim His Love…..and to Christianize this de-Christianized world……the journey continues.